In this short article we meet visual artist, Désiré Betty, from Canada. I stumbled upon Whistle Project in my search for artistic opportunities. I was intrigued by the project concept and wanted to participate. I appreciated the fact that it was not just a film, but promoted artistic imagery and provided a platform for national/international artists to share their artistic vision based on the film’s central theme/premise. I have always found a strong correlation between whistling and eeriness. I have always associated a negative connotation/undertone to it. When I read that the main plot centered around the suspicion that whistling drew in evil, I was sold on the concept as I unknowingly already believed in the folklore/superstition. As per usual, I like to research to gain insight into any particular subject matter. Obtaining an overview of the concept and/or feeling that I want to convey in my artwork aids me in properly channeling my focus. I read more on the whistling folklore as well as reviewed the storyline and imagery that was provided. The rest of my artistic process - flowed into place as I sketched ideas that came to mind based on the material that I had reviewed. 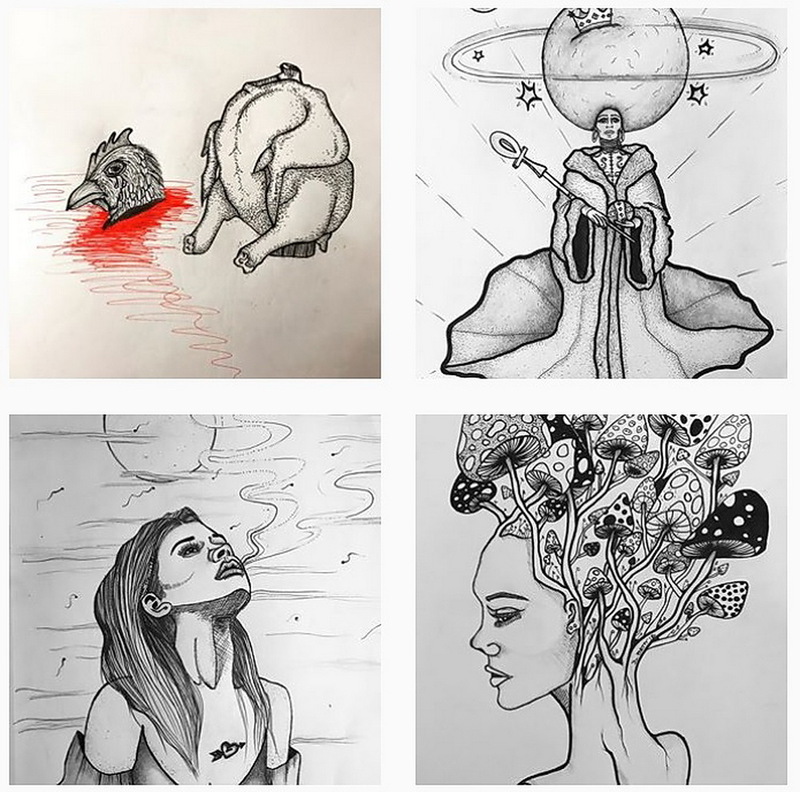 What was your artistic style, any influences (comments)? 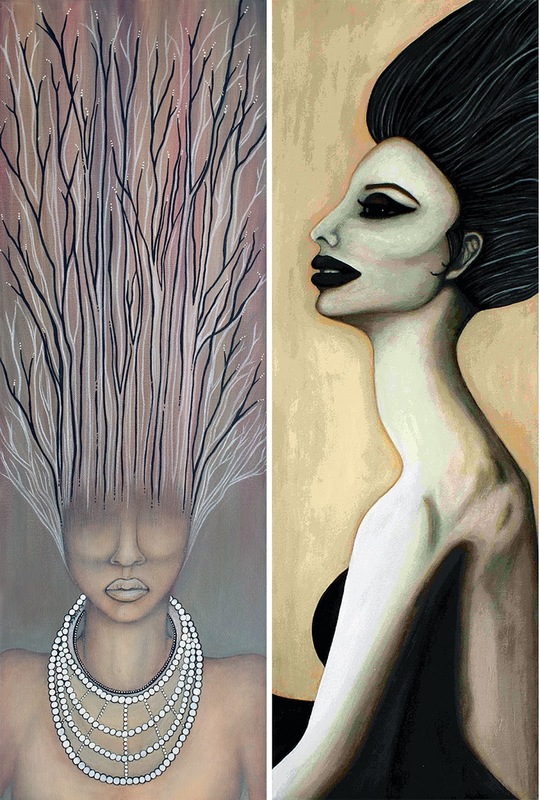 My artistic style is my own, using the dark and earthy tone color palettes that I tend to gravitate towards. I was influenced by the Whistle Project imagery and my own creative mind. I believe in superstitions to a certain degree. The mind is very powerful and will make whatever you believe a reality. If you are aware of a particular superstition or folklore, it will inherently stay with you and influence your actions. For example, walking under a ladder is considered to be back luck, therefore, instead of trying to disprove it/pretend I do not believe it, I simply avoid it. I do not want to be the one to prove it to be true (i.e. bring forth bad luck). I want viewers of my work to feel a sense of vulnerability – one that each individual possesses, whether they like to admit it or not. Evil surrounds us, but it is up to us to not allow it to control us. My work relates to the dark theme and represents the depths of darkness exists in our world. Individuals are unique, therefore, when allowing multiple individuals to collectively tell the same story in their own way, it inevitably brings about the most unique views that anyone could think of. It provides endless conceptual understandings of the same theme – endless opportunities for artistic expression. I believe that people should support one another. Any project that aims to be creative and step outside the box, should be supported by humanity as a whole. Creativity is a way in which to escape reality and live in fantasy – it allows for minds to open up to new possibilities and ways of thinking. Viewing all the WHISTLE project artwork will inevitably be a unique and thought provoking experience. The artwork I created specifically for Whistle relates to the story by way of representing characters that are unaware / innocent to their surroundings. Evil lurks in the shadows, weakness draws it in, but remaining in control of oneself – does not allow it to penetrate within – it merely allows it to skim the surface. We can live amongst evil, but it can not hurt us, if we do not allow it to/play into it (in the case of the film, inviting it in through whistling). All the works created for WHISTLE project by Desire, will be available to the public during the transmedia exhibition. Artist Désiré Betty has long explored the spiritual serenity that manifests itself through her artistic expression she calls ‘Perpetual Freedom Art’. The characters she paints are mostly women or seemingly androgynous figures along with complimentary abstract pieces that represent their creative realms. Her inspiration for each piece is driven by her fascination with the power of aesthetics. 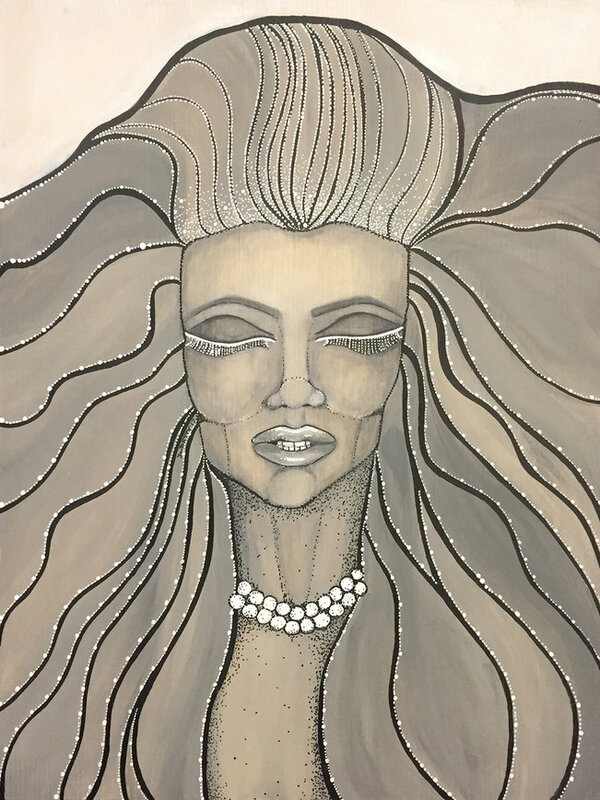 Her characters represent a portrayal of revitalized appreciation for inner strength and conviction by way of shedding the facade that several inherently assume in order to meet the societal status quo. These characters are intriguing and possess a certain je ne sais quoi [in French, it literally means, “I don’t know what”], as they do not seek validation from the external world. This collection of work reflects interests focused on elegance, fluidity, exaggerated proportions, dignified characters and creative environments. 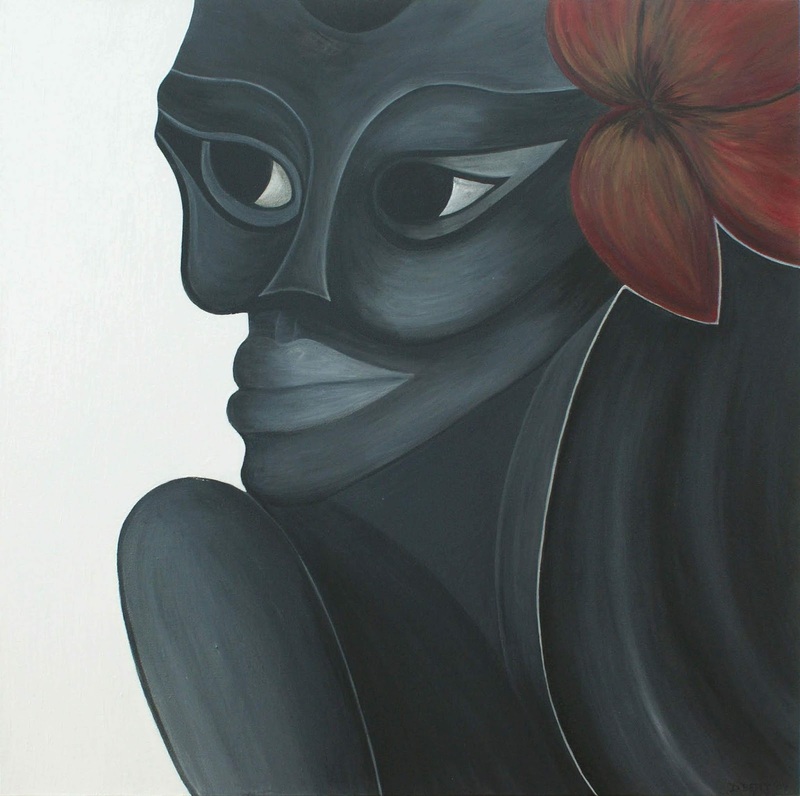 Her aim is to draw awareness to the perpetual interplay of ego, psyche and soul.